Every spring, the cycling world is captivated by the brutal, one-day races populating Belgium and France. Known as the spring classics, these races come in rapid succession. From one big day to the next, each race has it’s own challenges. Collectively, these races take an enormous toll and it takes a special type of rider to embrace them. Team Sky has allowed TrainingPeaks access to Christian Knees’ files from his classics run. From E3 Harelbeke on March 27th through Paris-Roubaix on April 12th, Knees raced a total of eight times. Keep in mind that prior to starting this run, he had already raced at the Tour of Qatar, Tour of Oman, Omloop Het Nieuwsblad, Kuurne-Brussels-Kuurne, Strade Bianchi, and Paris-Nice. Working for his teammate and eventual race winner Geraint Thomas, Knees puts out big efforts in the middle of the race to keep his team leaders safe in the bunch. He puts out his top 20 minute power value for all the races during this time. Showing his strength, Knees still puts in a solid effort late in the race during the key sections leading into the Paterberg and Oude Kwaremont climbs. View Knees’ full Stages power file here. Just two days after racing E3 Harelbeke, Knees lines up for Gent Wevelgem. With winds in the 30 to 40 mph range, he was one of only 39 riders to finish out of 200 starters. Once again Knees worked for Geraint Thomas, who finished third. Like E3, most of Knees’ peak powers come during the middle of the race. Knees gets one day of rest before starting 3 Days of De Panne, which actually has four stages. The opening stage featured more wind and Knees worked with other teammates to help bring back an early breakaway. During the second stage, Knees put in a strong effort over the final 30km to help teammate Elia Vivian take second place. During the final 40 minutes, Knees put out a Normalized Power of 354 watts, and averaged 44.4km/h (27.5mph). This is after having ridden for five hours at an NP of 304 watts and buring 4380 kilojoules. The final road stage was another tough day for Knees. He and his teammates worked to bring back a 13 man breakaway. The TT stage was not just an easy ride for Knees. After three stages, one that had just finished hours before, he still managed to produce almost 4W/kg for just over 20 minutes. The Tour of Flanders is one of the five monuments of cycling. Considered one of the hardest single day races in all of cycling, Knees once again worked to keep his team leaders near the front. After 200km of working for this teammates, Knees eventually had to pull out of the race. His day was summed up by his coach, Shaun Stephens, “Christian’s job in Flanders was to cover the breaks at the beginning which he did for the first 35km of the race. Once we were satisfied with the day’s break, Christian was given a brief reprieve before being asked to control the gap to the break,” said Stephens. “He virtually spent the next 75km, approximately kilometer 55 to 130, riding on the front of the peloton to ensure our team was well positioned and ready for the attacks to come during the second half of the race.” This section Stephens refers to was just under two hours at 324 NP, 3.59w/kg, and 38.1km/h. He set his peak 30, 60, and 90 minute values during this segment. His day certainly was not done after this. He rode for another 70km at an average of 303 NP at 36.3km/h before calling it a day. Knees’ final classic race was another monument of cycling. Paris Roubaix is another race many consider among the hardest of the year. With virtually no warm up, the racing started early. Again, it was Knees’ task to take up the workload early for his teammates. Knees’ Peak 1 minute to 1 hour power values all come from the 5km to 55.3km. This is his highest Peak 1 hour value of any of the races. Amazingly, his Peak 2 hour power of 285 started just 1 hour later. An hour and ten minutes into that 2 hour period, Knees’ Peak 90 minutes starts and finishes 40 minutes after his 2 hour peak ends. This shows that despite going hard he lifted his effort to continue helping his teammates. The spring classics are some of the toughest days of racing for the riders that takes them on. Just watching the racing you see riders battling across the narrow, cobbled roads fighting the elements to accomplish the goals of the team. Reviewing Knees’ data gives an inside look into how much these riders push themselves to the limits. 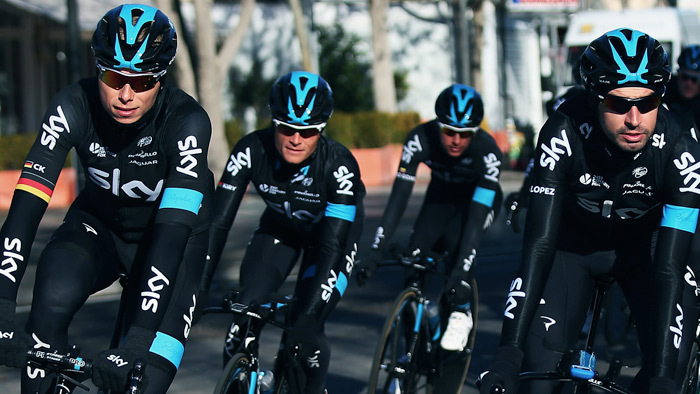 Power data collected by Team Sky product supplier Stages Cycling.